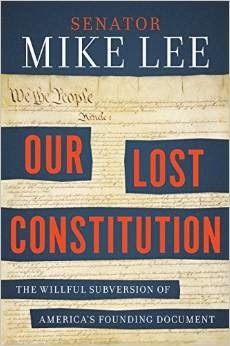 It’s still early in the year, but by far one of the best books to have been published in 2015 is Senator Mike Lee’s Our Lost Constitution: The Willful Subversion of America’s Founding Document ($27.95, Sentinel, an imprint of the Penguin Group). Lee (R-Utah) is the chairman of the Senate Steering Committee and an appointed advisor to Senate Majority Leaders Mitch McConnell. A former Supreme Court clerk, he serves on the Senate Judiciary Committee. When you read his book, you will give a silent prayer of thanks that someone so knowledgeable about the Constitution and so dedicated to it has been elected to defend it. Indeed, Senators and other U.S. officials take an oath to defend the Constitution, but it has long been honored more in word than deed. This book is especially important because we are living through a period widely understood to be one of lawlessness in the highest office of the land; a fearful situation in which the President has simply chosen to ignore the vital and stipulated role of the legislative branch in the creation of policy. If you have never read the Constitution or were only briefly taught that its first ten Amendments are our Bill of Rights, this book will provide you with an understand that opens your eyes to the great issue of our time that the way the Constitution has continued to serve all Americans even though it has been under duress since the days of Franklin D. Roosevelt who created a huge federal government with asserted powers not found in the Constitution. Want to really understand what is happening at the highest levels of government in America today? Read Sen. Lee’s extraordinary and very interesting book on the subject. I have been reading Larry Bell’s commentaries on the Forbes magazine site for a long time. He is a Professor of Architecture at the University of Houston, but he is known to his readers as one of the most perceptive writers about the global warming/climate change hoax with which we have been living since the late 1980s. He brings a host of facts along with his opinion, making him invaluable to those trying to sort out the lies. 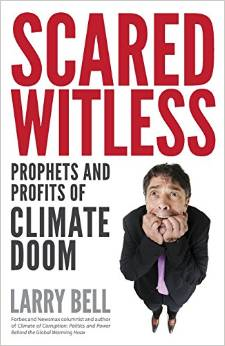 His latest book is Scared Witless: Prophets and Profits of Climate Doom ($22.95, Stairway Press, softcover) and if you have been promising yourself you want to know the truth about the alleged threats to planet Earth, then this most certainly is the book to read. You will learn how and why billions have been squandered by our government and others on the apocalyptic myths that have been repeated endlessly in the mainstream media. There is no scientific basis to much of what is still being taught in our schools and presented as climate policy by the government and the many environmental groups that profit from keep everyone frightened. Bell’s book is easy to read which is a blessing when you consider the science it addresses and presents. 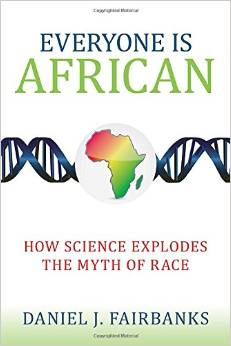 Everyone is African: How Science Explodes the Myth of Race by Daniel J. Fairbanks ($18.00, Prometheus Books, softcover) examines the research about DNA and the origins of the human race, all of which concludes that we are a single human race, sharing most of our DNA and differing only in terms of mutations that occurred after our ancestors migrated from Africa sixty to seventy thousand years ago. Fairbanks is the dean of the College of Science and Health at Utah Valley University, a research geneticist, and author. What he has to say will upset those who cling to race as an important “difference”, but what they are really addressing are cultural and social differences, not racial ones. The science presented is comprehensible even to someone without a background and the conclusions the book arrives at should be more widely known. Few criminal acts and events evoke more fear and outrage than shootings at schools that take the lives of students and teachers. Two comes swiftly to mind, Columbine High School in 1999 and Sandy Hook Elementary in 2012. Peter Langman is a psychologist who has made an intensive study of the shooters in these and some 48 our incidents. 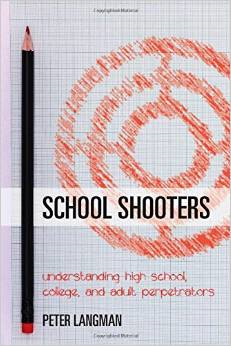 His book, School Shooters ($31.00, Rowman and Littlefield) provides a wealth of information and insight regarding the gunmen, mostly younger and white, mostly psychotic and psychopathic. In general they lacked the normal constraints on such behavior being either narcissistic, lacking empathy, or seeking to empower themselves to offset feelings of inadequacy. The one thing I concluded from reading this book was that all were what we would call “losers” in some respect, failing in school, unable to hold jobs, in trouble of one sort of another. Langman to his credit says there is probably no way to identify the next school shooter or protect against the next shooting. Science is one of those topics we hear about all the time, but unless you studied it in school or college, it is also one of those topics about which many of us have a very limited knowledge. You can improve yours by reading The Story of Science: From the Writings of Aristotle to the Big Bang Theory by Susan Wise Bauer ($26.95, W.W. Norton). A best-selling writer and historian, Bauer introduces the reader to the development of great science writing as she walks you through thirty-six seminal scientific texts spanning 2,500 years, making them more approachable in a narrative of the human understanding of our world and beyond. This book connects the dots, positioning important scientific texts in both their historical and scientific contexts. Over the years I have received many cookbooks and one of the best publishes of them is Pelican Publishing Company of New Orleans. 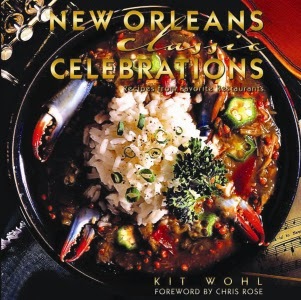 Among their latest is Kit Wohl’s New Orleans Classic Celebrations ($16.95). Anyone who has ever visited New Orleans comes away with memories of the fabulous cuisine that its many restaurants offer. Wohl is an author, photographer, and artist. She works with chefs, restaurants, and hotels around the nation and this book is her tenth. It features a hundred color photos to illustrate its many fabulous recipes such as Le Petite Grocery’s blue crab beignets, onion soup from Arnaud’s, and Mosca’s Chicken Grande. They have easy-to-follow instructions for the home cook and the photos alone would make one want to head to the kitchen to prepare and share any one of the wonderful dishes. Pelican has a series devoted to classic recipes for desserts, brunches, seafood and appetizers, among others. A great gift for oneself or the “foodie” you know will love it. I love a book that exists just to be fun. 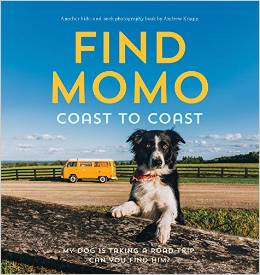 That is a perfect description of Find Momo Coast to Coast ($14.95, Quirk Books, softcover) by photographer Andrew Knapp and his border collie Momo who came to fame in 2012 when Knapp began sharing photos of him on Instragram. Together they made their literary debut in 2013 with “Find Momo” as that enjoyed playing hide-and-seek around the world. This new book chronicles a 15,000 miles tail-waggingly fun adventure across the U.S. and Canada. The photos are a splendid way for anyone old or young to get acquainted with both nations as both famed sites and those little known are visited and Momo peeks out at you after you finally find him in the setting. It never ceases to be entertaining. I have been a fan of Dana Perino from her days as the press secretary to George W. Bush and now as one of the Fox News show, The Five. It doesn’t hurt that she is simply quite beautiful, but I have always been impressed by, first, her ability to deal with the White House press during the Bush years and, now, for the unfailingly wise interpretation of events and personalities about which she is asked to comment. Her new book is And the Good News Is… ($26.00, Twelve) is a memoir as well as a sharing of lessons she has learned in her life. 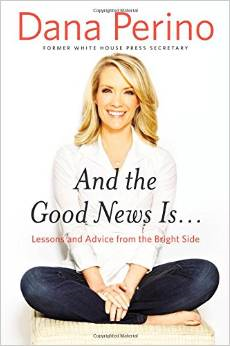 It would make especially good reading for any young woman who likewise admires her, but the book will surely please any reader because it is filled with good humor plus behind-the-scenes stories from her days in the White House and now at Fox News. We learn for example that her father expected her to pick out two news stories from the Denver Post or Rocky Mountain News and be prepared to discuss them a dinner. She credits that will learning how to articulate her thoughts and present her views persuasively. There is no doubt that she was hired for some very challenging jobs in her government career because others saw she had significant skills. She has had a full life to this point and one about which you will enjoy reading. We all look at actors and actresses, especially during award shows, and think what fabulous lives they have. Lisa Jakub tells a very different story in You Look Like That Girl: A Child Actor Stops Pretending and Finally Grows Up ($24.95, Beaufort Books). From the age of four, she had a very successful career, appearing in forty movies and television shows over the course of 18-years in which she had appeared in blockbusters like “Mrs. Doubtfire” and “Independence Day.” Her was indeed a life of red carpets, luxury, celebrity filled dinner parties, and all the things people think are fabulous. “However, like many actors I knew, I failed miserably at feeling successful. When we signed autographs we worried we would be failures if we never signed another one. When we were auditioning, we worried we would never work again. When we were working, we worried that the film might be terrible and could ruin our careers.” Sounds like fun? Hardly. In a chapter titled “Professional Pretender”, Jakub says “I think that there should be Oscars given for coal mining. There should be a red carpet night for 011 operators and orphanage employees.” These were real jobs that real people were living. Here is a completely candid, honest look at the life of a child actor and ultimately how and why Jakub walked away from it to have a life based in the pursuit of reality. The Nazi Holocaust is fading into history except for those who survived it, their loved ones, and for the nation of Israel that rose from its ashes. It also produced many memoirs and each reminds us of the horrors of the 1930s and 40s. It also reminds us of the personal courage of people to survive a hatred we are seeing mirrored in today’s headlines of a comparable Islamic campaign to kill the Middle East’s Christians. An Improbable Journey: A True Story of Courage and Survival During World War II by Susan Schenkel, Ph.D. ($12.95, Brightfield Books, softcover) is based the lives of her parents, Leon and Siddi Schenkel. Siddi was only 16 when she was left on her own in Nazi Germany and, like Leon, she had found her way to Samarkand, Uzbekistan to escape the fate that before six million European Jews. That is where they met and fell in love. Together they faced starvation, homelessness, epidemics, and harassment from the Soviet police. Despite this, they had a baby. After the war they returned to Germany and a displaced persons camp from which they eventually made their way to America. This memoir is a small piece of history, but reading it will provide a unique window in those times and insights toward our present times. We think of it as the mansion that overlooks Arlington National Cemetery, but for a very long time before it was known as the George Washington Parke Custis Mansion and it was one of the most recognized buildings in the region, visible from almost anywhere in Washington, D.C. It was built by the step-grandson of Washington. It would become the home of his daughter, Mary Anna Custis Lee and her husband, General Robert E. Lee who had lived there for thirty years. 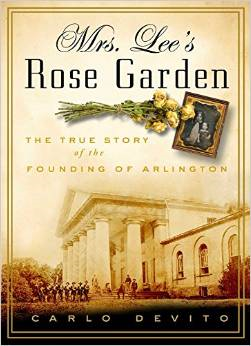 Mrs. Lee’s Rose Garden: The True Story of the Founding of Arlington by Carlo Devito ($17.95, Cider Mill Press) tells of its transition from a treasured Lee family home, to hallowed ground. Lee was already an acclaimed general at the time the Civil War broke out. Choosing the lead the South, it would also cause him the loss of the mansion. Its vast grounds were chosen as a national cemetery not just for their location, but as a rebuke to Lee. This is a short book, but it is filled with the drama of the lives most intimately involved with the mansion and provides a wonderful look at the pre-and-post Civil War era. They come alive as real people faced with their personal and the national dramas. Wars are the punctuation marks of history and they generate much telling of it. Whole libraries could be filled with those about World War II and you can add Hell from the Heavens: The Epic Story of the USS Laffey and World War II’s Greatest Kamikaze Attack by John Wukovits ($25.99, Da Capo Press). In our times we have the Muslim suicide bombers, but during WWII the Japanese had their own suicide killers who flew aircraft loaded with explosives into war ships. The Laffey gain fame as “The ship that refused to die”, but not until thirty-two of its crew had died, over seventy were wounded, and the ship was gravely damaged. On April 16, 1945 he was attacked by twenty-two kamikaze aircraft, marking the largest single-ship attack of the war. Nine of the aircraft were shot down in the 80-minute battle and, despite the damage, the ship managed to return home. This year marks the 70th anniversary of the attack. The hero of the story is the Laffey’s commander, F. Julian Becton, who took an inexperienced crew—many just barely out of high school—and prepared them for battle with rigorous training drills. The whole crew were, of course, heroes and testimony to “the greatest generation” that faced a fanatical, determined enemy and defeated it. Although they were on the wrong side of the law, we still have a strange sweet spot for the bad boys, the criminals who made history in their own way. That is why the Mafia became part of U.S. history after some of its members migrated from Italy. The era of Prohibition became a unique opportunity to make a lot of money providing the booze that a Constitutional Amendment had banned. Bill Friedman has written a massive tome, 30 Illegal Years to the Strip ($19.99, available from Internet book outlets, ebook $9.99. It looks at the careers of the most powerful gangsters in American history; men whose names like Al Capone, Charlie Luciano, and Meyer Lansky are well known thanks to the popular culture of films and television. The criminals of that era would go on to build 80% of the early Las Vegas Strip gambling resorts from the Flamingo in 1946 to Caesars Palace in 1966. This is an intensely researched book about three decades of organized crime starting with Prohibition and how these hoodlums changed course to set in motion the most famed gaming capital in America. Under different circumstances they might have been regarded as business leaders, but they also occasionally ordered the murder of those that threatened their lives and livelihood. During WWII, Luciano and Lansky would have been regarded as heroes for ordering dock workers to cooperation with U.S. Naval intelligence to thwart the German U-boat attacks on allied ships. Chapter by chapter this is fascinating history. If and when the nation encounters a financial meltdown, it won’t be because lots of well- informed people did not issue warnings. The latest is Michael D. Tanner’s Going for Broke: Deficits, Debt, and the Entitlement Crisis ($18.95, Cato Institute). Tanner is a senior fellow with the libertarian Cato Institute, an expert on health care reform, social welfare policy, and Social Security. His latest book points to a federal government that continues to grow and the overspending for which it has become famous. At this writing, we have an $18 trillion debt. In sum, Tanner warms could end up a financial basket case like Greece. The entitlement programs represent 47% of federal spending today. The addition of the Affordable Care Act only adds to deficit to the tune of a trillion a year. This book will be read by those who take such matters seriously, but its predictions will affect everyone. If Tanner’s book doesn’t keep you up at night, Philip Kotler’s Confronting Capitalism will ($26.00, Amacom). Kotler is a professor of International marketing at the Kellogg School of Management, Northwestern University, but trained initially as an economist, being taught by the University of Chicago’s famed free-market evangelist, Milton Friedman, and later under Paul Samuelson at MIT. Suffice to say, he has terrific credentials, but he also has a host of reservations about the capitalist system that has made the USA the wealthiest nation on planet Earth and which has survived depressions and recessions once the government got out of the way and let it work. Kotler serves up a book filled with reasons, trends and predictions that suggests trouble ahead, but I have to say I have been reviewing books for over fifty years at this point and have seen this kind of thing before. Is he right? Maybe. Your move! 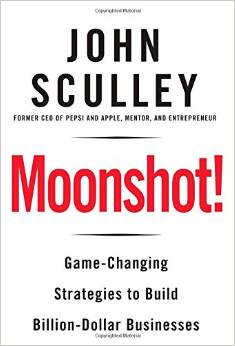 People love to read books by people who have achieved great success and that is a good description of John Sculley, the former CEO of Pepsi and Apple. If you would like to join that multi-millionaire club, you might want to read his book Moonshot! Game-Changing Strategies to Build Billion-Dollar Businesses ($27.95, Rosette Books). The book’s target audience are entrepreneurs, investors and young business leaders. Sculley, unlike the academics noted above, has been there first hand and his book says that all those high tech industries are going to disrupt virtually every industry in some fashion. Moreover, the traditional business plan has been irrelevant and is being replaced by the customer plant. Indeed, the best way in the future to success is to provide superb customer service and, best of all, this is the best time in history to build a billion-dollar business. Now this is the kind of book I like reading! There is no end to books offering advice on leadership skills and for anyone in the world of business or any other activity they can often be very helpful. 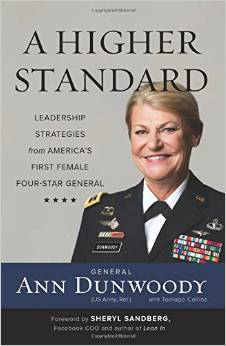 A Higher Standard was written by General Ann Dunwoody (U.S. Army, Ret.) and is subtitled “Leadership skills from America’s first female four-star general” ($25.99, Da Capo Press) and it is just that. She relates her 37 years with the military and what she learned along the way, sharing her view they men and women must pursue excellence, demonstrate integrity, and cultivate endurance. Best of all it is filled with practical business advice such as never ignoring a mistake and holding those who make them accountable. She says leaders aren’t invincible and should try to be, while at the same time learning to recognize your advocates, patronizers, and detractors. She advises on the best ways to form a winning team. And much more. She was the first woman to become a four-star general so she knows whereof she speaks. For those in the management ranks, you might consider reading Laurie Sudbrink’s Leading With GRIT: Inspiring Action and Accountability with Generosity, Respect, Integrity, and Truth ($35.00 Wiley). How do you know this is worth reading? Consider the publisher, Wiley, one of the top business book publishers. Then consider the author who brings twenty years of corporate experience in human relations, management, sales, marketing and training to this book. This is a practical leadership guide and, at the same time, will show you how to approach your job and life with a positive feeling about who you are and where you’re going. Those who master leadership skills and attitudes go onto to become leaders and this book is a good place to start. 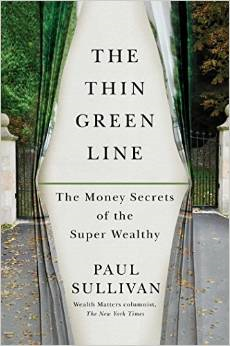 When those big bucks begin to come in, you might want to read Paul Sullivan’s The Thin Green Line: The Money Secrets of the Super Wealthy ($27.00, Simon & Schuster). I will hold onto this one in case I hit the Lotto Power Ball. Sullivan is the “Wealth Matters” columnist at The New York Times and draws on his experience writing about today’s One Percent to show others how to make better financial decisions. Indeed, he makes a distinction between being wealthy and being rich, the former being having more money than you need to do all the things you want. Being rich, on the other hand, says Sullivan means being financial secure even in hard times. His book looks at how we think about money and wealth, and being honest with our fears and insecurities, as a way to arrive at rational decisions. He discusses both spending and saving money which is something to which we often do not give much thought. If you intend to get rich or already closing in on that level of security, this is a book worth reading. Increasingly, people and industries here in the West are looking at doing business in Asia. Mark L. Clifford has lived in Asia for twenty-five years as a journalist, author, and policy advisor, witnessing and chronicling the ups and downs of Asia’s spectacular economic rise. His new book is The Greening of Asia: The Business Case for Solving Asia’s Environmental Emergency ($29.95, Columbia University Press) and it looks at the way, for example, China’s environment, its air and water, has suffered in the quest to embrace a free market economy and join the rest of the world in the pursuit of a growing, successful economy. Clifford is an advocate for “green” solutions to issues such as energy use and pollution, so his book, while celebrating the success Asian business is enjoying, also is filled with warnings about the price it will pay for it. The problem with that is that wind and solar energy cannot even begin to meet the needs of Asia or anywhere else for that matter. Europe is already divesting itself of these power sources and returning to coal and considering nuclear power to meet its growing needs. There will never be an end to books on investing and that is because changes in the business community, new technologies that generate new investment options, and other factors all need to be addressed. Ken Fisher, a billionaire, best-selling author, and Forbes “Portfolio Strategy” columnist is well worth reading for his insights and advice. 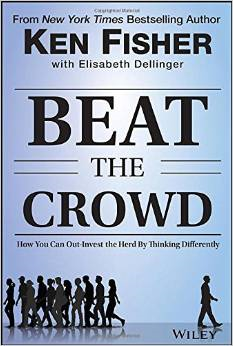 His new book, Beat the Crowd: How You Can Out-Invest the Herd by Thinking Differently ($29.95, Wiley) is the book anyone contemplating investing or already doing so should read because he explores our contrarianism as an investment strategy rather than following the herd is worth understanding. Wall Street’s definition of contrarian investing is simplistic and wrong, says Fisher, one of the most successful money managers in history. His firm controls nearly $65 billion in assets. He defines it as being smarter than the crowd by finding and leveraging valuable information that isn’t already priced into a stock. His book reveals how to train your brain to battle the media, the crowd, your friends, and your neighbors. Independent thought is the key to successful investing says Fisher. There’s nothing magical about this and he says that you just have to be right more often than wrong. “A 60% success rate keeps you well ahead of most.” It is filled with the most basic knowledge of the market to know whether you are a novice or serious investor. “Stocks are your long-term way to own” the benefits of the changes occurring thanks in large part to new and developing technologies shaping the economy. This is definitely the book to read on this subject. David Ignatius is a prize-winning columnist for the Washington Post who has more than twenty-five year’s experience covering the Middle East and the CIA. He is also the author of several novels that have put him in the ranks of our best. He cements that reputation with The Director ($16.95, W.W. Norton, softcover) that begins when a disheveled youth walks into the American consulate in Hamburg and demands a private interview with the new CIA director. The consulate is dismissive until he tells them the agency has been hacked and that he has a list of undercover agents’ names as proof. At this point you will be reading a fast-paced thriller that feels like it was ripped from the headlines as we read about such hacks. The new Director has only been in office for a week when he receives word that the agency has been hacked and that no one is safe. What the young hacker wants is an exchange of the information he has for protection from the people trying to kill him. A young, tech-savvy agent is assigned to the case, but the Director begins to have suspicions of him. This is a cyber-espionage novel that guarantees a story you will not want to put down until the last page. 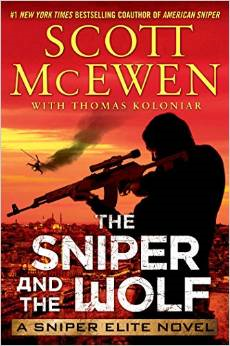 Another action-packed novel is Scott McEwen’s The Sniper and the Wolf ($24.99, Touchstone, an imprint of Simon and Schuster). McEwen is the coauthor with Chris Kyle of the huge bestseller of “American Sniper” which went on to become an Oscar-winning blockbuster film. This novel was co-written with Thomas Kolonair. Together they have created a heart-pounding military thriller, the third inspired by Special Ops missions. In this story, hero Gil Shannon joins up with an unlikely Russian ally in order to stop a terrorist plot bent on destruction across Europe. Shannon is hot on the trail of a Chechen terrorist when his mission is exposed by a traitor high up in the U.S. government and he must turn to a Russian counterpart. Together they discover his goal is to upend the U.S. economy and the stability of the Western world. The hunt takes Shannon from Sicily to the Ukraine to Russia and you get to go along as he must get to the one sniper who might be his equal and who wants to kill him. The fact that the story is based on events from real life makes it a page-turner. Thrillers abound and Charlie Newton’s Traitor’s Gate ($14.95, Thomas & Mercer, softcover) takes the reader to the days just before the first shots of World War II. A survivor of a brutal massacre that left her family dead, Saba Hassouneh becomes The Raven, a freedom fighter hunted throughout the Middle East by the British colonial powers and religious mullahs alike. When she meets Eddie Owen, a petroleum engineer, their attraction is immediate, but their goals are diametrically opposed because she is eyeing British refineries as a point of attack. The must resolve their personal issues and, in doing so, determine who will own the skies of World War II. Victoria Shorr intended to write a non-fiction account of the life of a beloved Brazillian legend, the one-eyed bandit Lampiao and his lover, Maria Bonita, but instead she opted to tell their story In Backlands ($25.95, W.W. Norton), bring to life the story of this Robin Hood hero whose gang avoided capture for a long time by living in the Sertao, the name which translated into the title of this story. They did indeed steal from the rich and give to the poor in the early decades of the 20th century, outwitting the authorities for twenty years. They were regarded as heroes by poor farmers and struggling merchants. 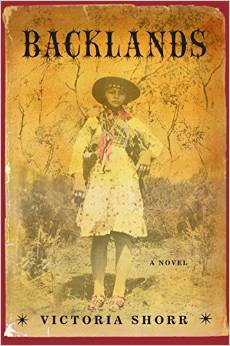 The author devoted ten years to researching the story, concluding that the lives of Lampiao and Bonita lent themselves better to a fictional format. The facts remain true, but her lyrical telling of them makes this a story well worth reading. Mystery and murder combine in The Fatal Sin of Love ($11.50, Back Bay Press, softcover). Somebody’s killing chocolate lovers in Boston and China. When a wealthy Back Bay widow dies in her sleep, nobody suspects that it’s just the beginning of a carefully laid out plot to hijack the multimillion dollar inheritance that the Chinese American dowager left to members of her far-flung family. Well, nobody but amateur detectives Ann Lee and Fang Chen. Written by G.X. Chen, who was born in Shanghai and raised in Hong Kong. A trip back to the mainland China in 1965 trapped her there for decades under Communist rule. After the Cultural Revolution, she became a best-selling author. These days she has a master’s degree from the University of New Mexico, having left China in 1989. She is now an American citizen, this is her fourth American novel. The good news is that there are more to come. This is a great way to learn about another culture while enjoying a great mystery as well. That’s it for May! Come back next month for more news of books you may not hear or read about elsewhere. Tell your book-loving family members, friends and co-workers about Bookviews.com so they too can benefit from its eclectic news about the latest in non-fiction and fiction. Great review. I don't have much idea about the book and author. But this blog helped me know more about the interesting book. thank you so much for the wonderful review and you review helped me to get know the book. Our Lost Constitution is away Forward to Principles, our Founding men and women were raised up for the purposes of liberty. We are all Gods Children, who are inclined by that nature to see TRUTH. We are fortunate that concerned senators like Mike Lee are calling out socialist forces, naming them, and educating the public. All loyal Americans should read this book and prevent any further desecration of the primary underpinning of our country, our rights, and our liberties! Post about the book views of each book is so fabulous.Provide detailed idea about the main content of the book.Reviews are also help us to get clear details.Best essay writing service reviews helped me to choose the best writing help by provide good reviews. That was a well amazing post. I liked it very much.The best essay writing service providing the best online writings service with very affordable rate of cost. eToro is the best forex broker for new and established traders. Great list of books to read this coming year. Thanks for sharing these. Have a good day! Get the best essay writing service from Australia's no.1 essay help solution provider.